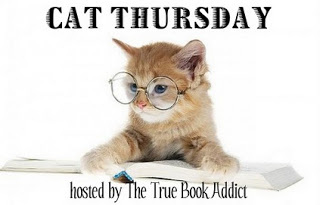 Musings of a Bookish Kitty: Cat Thursday: Let Me Have Some! Awww, sharing! My cats growl when one gets too close to the food or water dish! Gofita - Mine have never minded sharing. At first I separated the water dishes for my cats and dog, but the cats always drank from the dog's water dish. I finally just left the one out and everyone was just as happy. Aww look at that nice sharing. LOL how funny. They're so silly when they do things like that. Mine do that with their food. I can put 4 plates down but they'll squeeze around 2 of them to eat and leave the others completely alone. It is all about the sharing! McGuffy Ann - Yes, it is! Awww, look at those cuties. My kitten attempts to do that with the other cats but it never turns out well for him ;) The dogs don't mind though. Barkless - Poor kitty! Just wait until he's bigger. He'll show them! These posts always leave me feline good, thanks for another purrfect share.